Just compensation: Do Indian SEZ steal from the poor? A public hearing was convened on Monday, November 5 in New Delhi to discuss Special Economic Zones (SEZ) and land rights. The hearing was sponsored by Navdanya, which began as a program of the Research Foundation for Science, Technology and Ecology (RFSTE) and was founded by world-renowned scientist and environmentalist, Dr. Vandana Shiva. “The largest SEZs were allocated to Mukesh Ambani," said Dr. Shiva, chair of the public hearing. "This is a criminal subsidy the State is giving to the rich by stealing from the poor.” Eminent domain, known as land acquistion in India, is governed by the Land Acquistion Act of 1894. The public hearing resolved that the Act must be amended to ensure that the government does does not acquire land for private companies. The much-anticipated lighting of the next Olympic flame was dimmed when a Beijing resident burned himself to death last September. When Baoquan Wang was forcibly evicted from his home to make way for the city’s construction project for the 2008 Olympic Games in China, he became a human torch. The Geneva-based Centre on Housing Rights and Evictions said residents were often forced from their homes with little notice and little compensation, as the government embarks on a massive city redevelopment to accommodate the Games. "In Beijing, and in China more generally, the process of demolition and eviction is characterised by arbitrariness and lack of due process," the group said in a report. The statement prompted a sharp denial by China. A spokesman for the Foreign Ministry, Jiang Yu, said that “the citizens have had their compensation properly settled.” However, after demolition, the former inhabitants are forced to relocate from their communities. Once again, poor rural citizens are forced to make way for massive income and popularity generating events. The Bharatiya Janata Party, one of India's major political parties, created chaos in the Lok Sabha (House of the People), the lower chamber of the Indian Parliament, on Tuesday, May 14, 2007, when the treasury benches did not oblige Mamata Banerjee, the leader of Trinamool Congress, who demanded amendments to the Land Acquisitions Act. As a result of the chaos, Speaker Somnath Chatterjee adjourned the house 15 minutes earlier than scheduled. Two months ago, at least 14 people were killed and more than one-hundred were injured in a West Bengal village during violent protests against farmland acquisition for industrialization under the proposed SEZ (Special Economic Zones). The government of India’s web site on SEZ lists about a hundred zones all over India that will be subject to acquisition under the SEZ Act as of May 1, 2007. The list includes a description of each development planned, the location of the area, the name of the developer, and the date of notification. India wants to industrialize, and it is going to do so regardless of the cost to its citizens' individual rights. As of March 16, 2007, the SEZ Act allows the Board broad authority to change the classification of an area that is already designated as a SEZ. S.O. 393(E)(iii)(d). The act is directed towards the rights and purposes of the acquisition for the developer and does not directly address individual property owner rights. Interestingly, the web site’s sections on “FAQs” and “the procedure for setting up the SEZs” are still under construction. 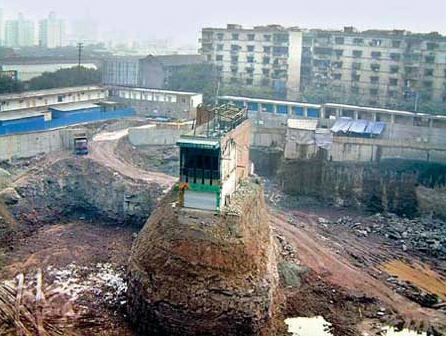 The nail house was demolished, but the Chinese government’s power is not unlimited. The house was demolished on April 2 after a three-year standoff that made international news and flooded the national blogs (China’s government has been censoring the media’s coverage of the incident). Last week, Wu signed an agreement to move into a similar-sized apartment in Chongqing, Time magazine reports. 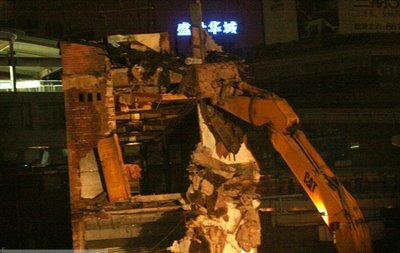 Time reported, based on a witnesses’ observations, that the two-story brick building was “clawed into dust by an earth mover as a few dozen reporters and people looked on.” Zhou Shuguang, who witnessed the event, told Time that the demolition took about three hours and he has posted pictures to his blog. Does this mean that China just demolished its progressive march towards preventing eminent domain abuse? Not quite. A Chicago Tribune article reported that the outcome is favorable to the couple who owned the “nail house”. They negotiated a ground-floor apartment with space to open up a restaurant. Wu did not want to give up the building for a space on a higher floor because of her restaurant business. What will the new property law in China hold for one woman’s battle against eminent domain? For two years, Ms. Wu Ping, a restaurant entrepreneur, has refused to yield to the unchecked power of developers. So her house stands in the middle of a construction site, towering above a 33-foot-deep pit. It is barricaded. They call it a "nail house" because it sticks out like a nail in neighborhoods have been "moved" (??) and because its owners are the last hold-outs. Dingzihu (???) is a Chinese word that means a household or person who refuses to vacate their home to make way for real estate development. Most of the other property owners in the Chonqing neighborhood have left. Photos of the house are all over the blogs and international media, although China's newspapers have been censored. Bloggers said the govenment decreed the subject was suddenly out of bounds. The developer plans to build a six-story shopping mall on the site. The homeowners have all been compensated for their lost property, but Ms. Wu turned down the offer of about $525,000 for her 263 square-yard house because she believes, “A citizen’s legal property is not to be encroached on.” This was the slogan planted by her husband, a local martial-arts champion, on a hand-painted banner on the roof. Ms. Wu and her husband refuse to leave until they are given similar property in the area in compensation. The National’s People’s Congress passed its new property law on March 16 this year. This new property law takes effect on October 1 and is intended to address the conflicts of a changing society, to protect the interests of farmers and of urban residents, when their homes are subject to eminent domain according to Yin Tian, a legal expert at Beijing University. Gone are the days of Mao, and now the socialist reform in China initiated by Xiaoping Deng in the 1980s is at the forefront again: this time by giving the people at least some individual property ownership rights. The government can still take land for public use, but the land will be owned by the individual and not the collective, at least, for some duration. China began discussing the first drafts of a property law in 2002. But in 2005, “leftists” objected to the law because they felt that the gap between the rich and poor would widen. The leftists had been opposed to any laws that moved China from a communist to a socialist or capitalist regime. They have debated over the direction of China’s economic and political development since the 1980s, when Xiaoping Deng launched the first economic reforms. Deng’s successors, retired leader Jiang Zemin and current state president and party leader Hu Jintao, continued Xiaoping’s policies of leading the country towards socialism but added “Chinese characteristics.” Essentially, China’s move towards socialism from communism can be more aptly described as “relaxing” communism. Although the changes resulted in rapid economic growth, it created increasing income gaps and regional imbalances due to the current leadership's regression toward a “people-centered” government. November 8, 2007Just compensation: Do Indian SEZ steal from the poor?